The research topic for my graduate thesis involves voxel-based image registration for the machining of investment castings. In this exploratory paradigm, one can 3D scan a near-net-shape casting to obtain a point cloud and then convert that data to a voxel structure. Using a voxel-based computer-aided manufacturing software, this voxel volume is aligned with a voxelized CAD model. Toolpath trajectories can then be generated from this relative positioning. This registration is heuristic in nature but achieves the practical objective of automating a particular aspect of the machining process. Moreover, this research advances a new perspective when considering such challenges encountered by industry. For my Capstone Senior Design Project I had the privilege of serving as team lead for a group of 5 engineers to deliver analysis and a final prototype of a cable suspended parallel robot (CSPR) to automate construction site scaffolding. As team lead I acted as the primary contact for our sponsor, organized team meetings, scheduled sponsor briefings and maintained a positive, creative environment for collaboration. This is a research article I co-authored that advances automated subtractive machining. 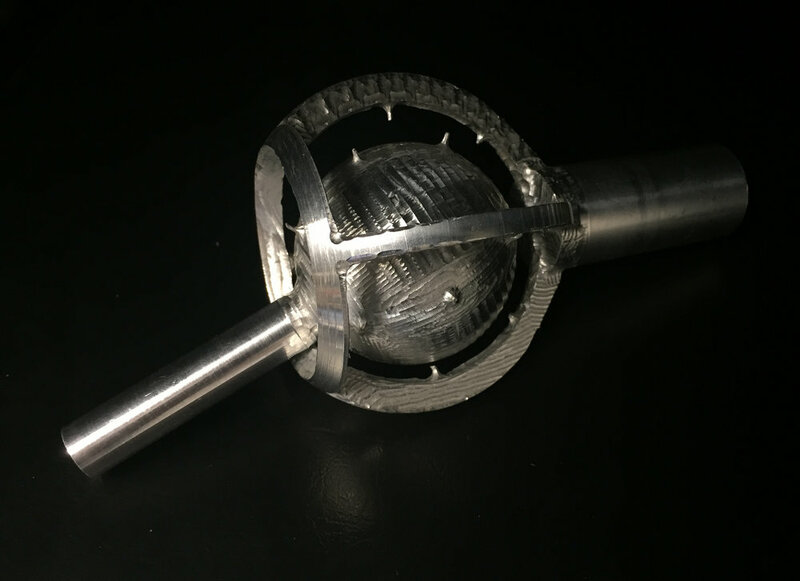 We used a voxel-based CAM to machine a ball-in-socket mechanism capable of relative motion by incorporating support structures into the part design. This procedure is in contrast to the way support structures are integrated in direct digital additive manufacturing. Other topics addressed are parallel computing, dynamic octree representation and tool path planning for gcode. The article was published in the ASME Journal of Manufacturing Science and Engineering. I had the opportunity to build my own small prototype 3-axis gantry CNC as part of the final Mechatronics course project. Programmed in C on a Texas Instruments MSP Launchpad microcontroller, the CNC was able to process simple gcode files and measure different tool offsets. I'm looking forward to revisiting this project later and expanding it by replacing the steppers with servo motors and implementing a PID controller on the MSP.